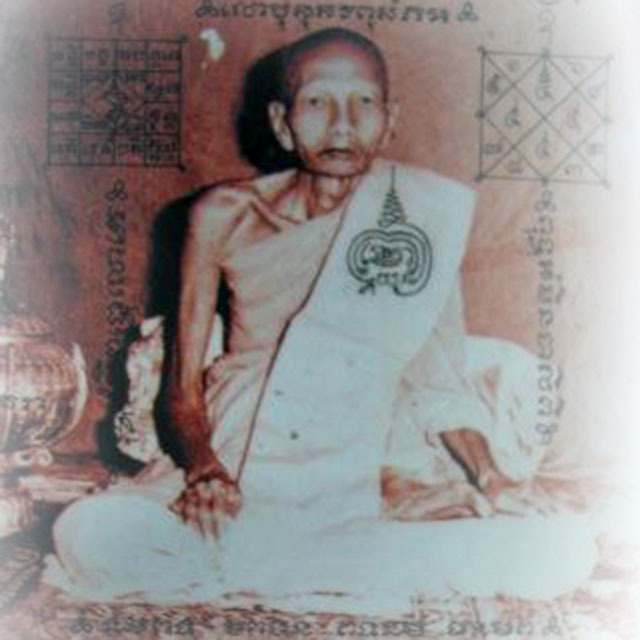 Luang Phor Noi was a resident of Dhamma Sala Municipality from birth. He was born in the 12th May 2426 BE, as the son of Mr. Saeng, and Mrs. Orn. When he was still a very young child, his father took him to the temple, and he spent most of his childhood years learning to read and write and other schooling, with Luang Phor Nuam, the Abbot of Wat Dhamma Sala. When he reached the age of 15, he ordained as a Samanera Novice monk at the temple of Wat Sam Graber Phueak. Luang Phu Noi would constantly travel between his temple and the temple of Wat Dhamma Sala where he had grown up during his childhood under tutelage of Luang Phor Nuam. After some time, Luang Phor Noi’s Mother became old and weak, and he disrobed to help her at work, as she was having difficulty. When his mum retired and he reached the age of 20, he re-ordained at Wat Dhamma Sala, on the 28th May 2446 BE. Pra Atigarn Luang Phor Tong, of Wat Lamud was his Upachaya Ordaining Officer, with the Abbot of Wat Dhamma Sala as his Gammawajajarn. , and Luang Phor Saeng of Wat Mai, was his Pra Anusawanajarn (Witness). 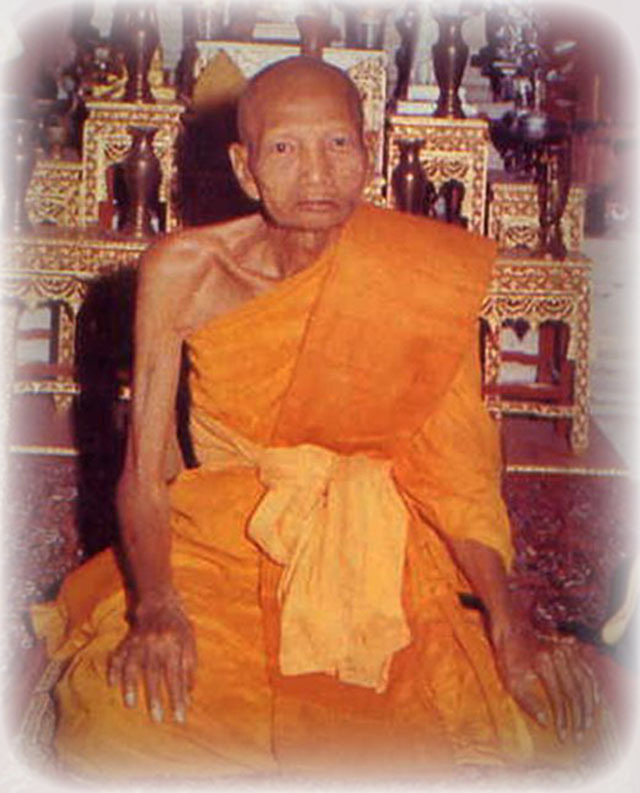 He recieved the Ordained Pali name of ‘Intasaro’, and was from then on truly known as Luang Phor Noi Intasaro. After his second Ordination, this time as fully fledge Bhikkhu in the Buddha Sasana, he began to study and practice the Dhamma Vinaya Buddhist Canon of Ordained Life with great exertion and diligence. He also began to beseech and study the practice of Wicha Akom Buddha Magic with many great Masters of the time, including Luang Phor Tong of Wat Lamud, Luang Phor Nuam his old Kroo Ba Ajarn of Wat Dhamma Sala, Luang Phor Jaeng, Luang Phor Saeng, and many other great Masters. He was able to absorb and master the many spells and formulas of the Wicha given to him, because he had learned how to read and write the Sacred Khom Agkhara script since a very young age with Luang Phor Nuam. Luang Phor Noi’s powers and abilities to enter deep Meditative States became highlyt adept, and his prowess soon came to be known by his Mentors, who gave him ever increasingly difficult to Master Wicha, which he seemed to absorb instantly and Master with ease. Luang Phor Noi was known for his well kept and diligent manner of self conduct, and restraint, and that he would never let his watchfulness of his own behaviour slip, always remaining within the rules of Ordained Monks, with mild manners and compassionate openness. He became a symbol of faith for the local devotees of the Province. He showed compassion to animals in need, and liked to seek solitude and silence, remaining in the peace of stillness, which he radiated outwards to those in his presence, stilling the troubled hearts and bringing them some peaceful respite from their daily sufferings. In the year 2495 BE, Luang Phor finished the construction project for the public primary school building of Wat Dhamma Sala for the local children to get some education. In 2501 BE, Luang Phor built the Uposatha Shrineroom. Luang Phor Noi built a concrete bridge for local market traders and folk to travel across the river easily and save them many miles of traveling distance. This improved the trade and economy of the municipality greatly, for which the local folk became ever more filled with faith for Luang Phor Noi. In 2505 BE, Luang Phor built a second school building for secondary school education. In 2510 BE, Luang Phor built a Chapana Sathan Funeral Crematory for the local folk at the temple, and in the year 2511 BE, he finished the building of a Kuti Songk Sangha Dormitory Building. In 2512 BE, Luang Phor Noi funded the construction of a new Hor Rakang (Temple Bell-House). The Amulets of Luang Phor Noi of Wat Dhamma Sala, are amongst the top 5 of all time Great Masters of Nakorn Pathom Province. 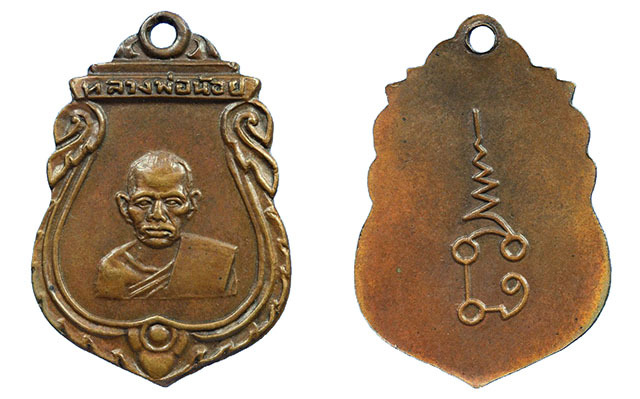 When one considers that Nakorn Pathom has produced many of the greatest masters of the last century, and that the amulets of Nakorn Pathom Masters are of the most collected and sought after by amulet aficionados. It is then obviously difficult to achieve such a high ranking as that of Luang Phor Noi. We can safely say that the pantheon of amulets of Luang Phor Noi is amongst the most highly sought after of all. Luang Phor Noi of Wat Dhamma Sala, and Luang Phor Noi of Wat Srisa Tong, are both Masters of Nakorn Pathom Province. Both Masters have enjoyed similar fame and recieved the same great respect from their faithful devotees. Luang Phor Noi of Wat Dhamma Sala was often invited to the most important Buddha Abhiseka blessing ceremonies because of his great prowess in empowering amulets. He had (and still has to this day) a large following of devotees, who sought his protection and blessings. 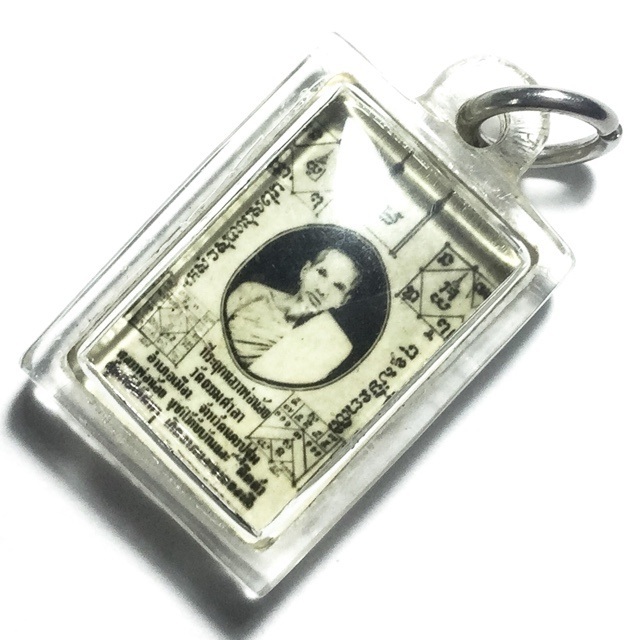 But Luang Phor Noi did not officially make an edition of amulets, until the year 2494 BE, when a large number of devotees gathered and asked Luang Phor for permission to bless a series of coin amulets, to distribute to his devotees to worship with. Luang Phor Noi was approached and asked, but in truth, he did not reply, and remained silent. This however was taken as a yes by the devotees, who then commissioned am artisan to create a design for the coins, with the image of Luang Phor Noi, within a Sema (shield shaped) coin. The first edition coin had a cameo image of Luang Phor Noi (head and shoulders) on the front face, with the words ‘Luang Phor Noi. The rear face had the Sacred Yant Na Bpathamang. 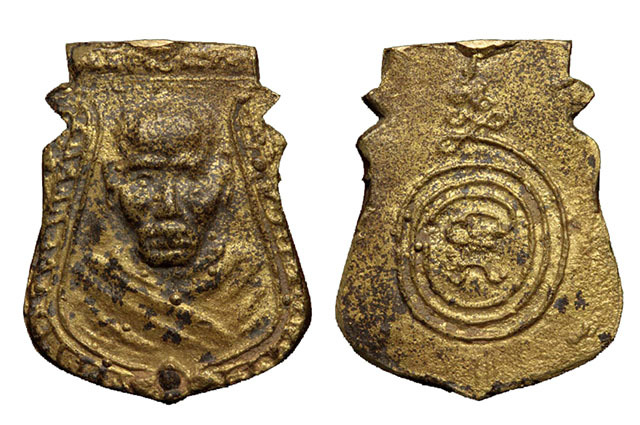 This first edition coin is less known by common people as the later released Rian Hnaa Suea, which in itself is a very rare and expensive amulet (reaching into the 2-3000$ range in good condition). But it is the Rian Sema 2494 BE which is in truth the first edition he ever made, and is even rarer, and can often fetch an even higher price than the Rian Hnaa Suea.